Up in the Yukon they say that you can freeze to death in less than an hour. It’s especially true when temperatures drop to 48 degrees below zero — like they did last week. So if you don’t dress right or your car dies and you get stuck outside, things can get bad really fast. The cold does violence to the skin first, signaling your capillaries to narrow, constricting the blood flow as your body tries to maintain its core temperature. Then you might start to tremble and shiver, uncontrollably, as hypothermia sets in. That shaking is your body’s involuntary reaction as it expands and contracts muscles in a frantic attempt to generate heat. Along with that an increase in blood pressure starts to affect both your heart and brain functions. If exposed to the cold long enough, you’ll begin to suffer cell damage, and if your skin freezes — that’s called frostbite. By then you might have started to hallucinate, which is common in extreme weather. But as your heart races you are burning up carbohydrates by sweating. Of course as the sweat cools more heat is lost. But still, your heart tries to compensate for the rapid changes you are experiencing, but it can’t. The only hope is to find shelter fast because, depending on your age and health, the stress alone can cause it to go into arrhythmia, or it could fibrillate, triggering a heart attack, blood clot, or aneurysm. Of course all the above can lead to sudden death before you’re actually frozen. Oh, and then there is the breath vapor — which can freeze when inhaled or exhaled. At 32 degrees Fahrenheit it takes one hour for a cup of water to freeze, but at 48 degrees below zero death lurks around every corner, under every rock, up every tree, and behind every door. This is the environment in which the Inland Tlingit people make their art. The Yukon is located between Canada’s British Columbia and Alaska. 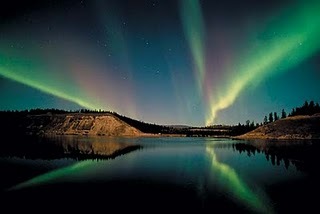 It is famous for its wondrous mountains, clear lakes, and its perfect view of the Aurora Borealis. Geographically it’s bigger than California, but it’s populated with only 34,000 people. Of that 34,000 about two-thirds live in the capital of Whitehorse. The other 10,000 are scattered around the rest of this unforgiving arctic territory. These small, ancient, and rugged communities are bound together by tradition and family. They are the descendants of nomads who came across the Bering Strait about 11,000 years ago when a land bridge existed there. The clans are known by their association with various animals — the raven, eagle, beaver, frog, etc. Likewise, these animals are featured prominently in their art. But thousands of years of culture changed when Europeans sailed into the area 200 years ago. Seeking to expand trade routes and looking to exploit the animals for the lucrative fur market, Europeans came and never looked back. As in other places around the continent during the Westward Expansion — and later during the Klondike Gold Rush of 1897 — they brought disease, religion, and an odd form of economics: Capitalism. But what does that have to do with art, you might ask? Well to begin with, it was one of the first things Europeans tried to suppress. Taking the natural resources wasn’t enough in the age of Imperialism, they also wanted their minds. Natives were forced to convert to Christianity and were subjected to well-documented abuses by a long list of newcomers. These days the Tlingit language is among the most endangered in the world; there are just a few hundred speakers left. So with this in mind, it’s important to understand that the art that they make isn’t the kind taught in art schools. Rather, it is something completely different. It’s inherently linked to their way of life and to their history, a means to convey their beliefs and a way to keep a record of what happened to them. Indeed in that isolated wilderness it’s no exaggeration to say that making art is a matter of life and death. After all, without your history, what are you? How can you know where you’re going if you don’t know where you’ve been? How will your children ever know their history, their legends, and their culture? In American kindergartens children are taught to color in pictures of Santa and of Christmas trees, of cartoons and other signifiers of Western culture. But for generations the Tlingit children were taught to be ashamed of their old ways, and only somewhat recently has that started to change. When approaching the First Nations people, as they are known (referring to all of the indigenous people of Canada, including the Tlingit), the tendency among some whites has been to document, catalog, archive, and then ultimately collect objects and stories from their culture. But doing so has meant the imposition of a rational and very Western concept of transaction. It is alien to people who have historically shared their resources for survival and helped each other out as a way of life. While on the surface it might appear harmless, this anthropological impulse to preserve has resulted in the removal of many things that can never be replaced. Just imagine, for example, if someone came to your house and took all of your dead grandfather’s clothes, all the pictures of him, his car, his cane, his hat, his glasses, his books, his tools … everything … eventually all you’d have left is a memory of the man. But imagine that being done systematically and on a massive scale — across the entire continent. Knowing about the loss of so many pieces of native peoples’ history and symbols of identity, you can start to sense the urgency and necessity of the arts in their communities. Dance. Music. Sculpture. Poetry. Storytelling. Language. It is not just symbolic; it all has meaning. But vivid descriptions and words are only stand-ins for the real thing and, as such, cannot replace authentic experience. For these reasons I thought it would be prudent to call someone who knows what it’s like to live there. I called up Doug Smarch Jr., an Inland Tlingit artist from Teslin, a small town near Whitehorse. He grew up there and eventually went to the San Francisco Art Institute and then later to UCLA. After traveling around the world he returned to where he was from, and now lives and works there. Beautiful view of the northern lights there.